Styled with spurlock skirt . Love it very much! Material and style is good. Very soft and comfortable. Would like a few nice buttons, otherwise perfect. Crazy soft. Washes beautifully (cold water, delicate cycle, lay flat to dry). One of the most versatile pieces in my wardrobe. Definitely one of my favorite cardigans. I have 2 colors already and will likely purchase another one. This is a high qualitty sweater. It’s cozy and very nice color (heather grey). I would recommend it to others. 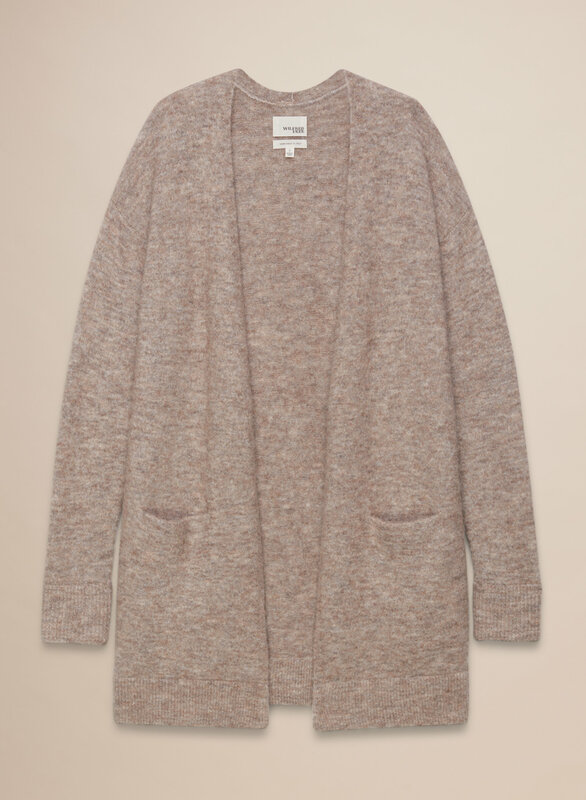 I like cardigans because I can't deal with fluctuating temperatures and this is really beautiful. It can be machine washed and hung to dry. It does pill but it cleans up with a sweater shaver thing. It's roomy but I say take your usual size as it's supposed to be that way. I love this sweater and have purchased it in two colours. It’s a versatile sweater, I can wear it to the office or on the weekend. Fits true to size and is very comfortable. Love the sweater. Ordered my usual size but found it too skimpy around the back. The sweater itself is wonderful and warm, but the wool feels scratchy on the skin and a little uncomfortable. I wear this sweater all the time. It's a great piece for layering. I love aronson sweater! I have 3 different colors! Soft and cozy! 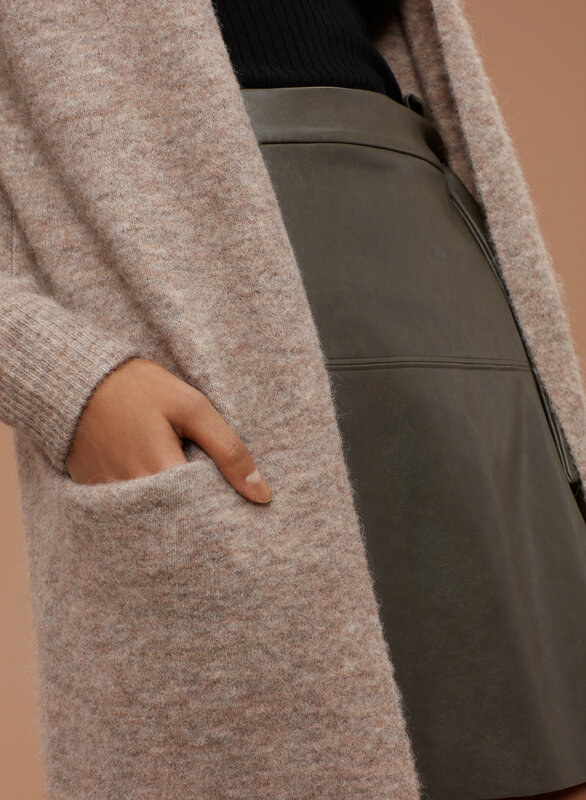 Perfect layering sweater for those cold days. Warm and classy. Got lots of compliments! Amazing quality, I am in love with this sweater. Comfy and cozy! And super warm! I read the review and found people saying this cardi ran large. I still decided to order my normal size S to have a slightly oversize look. But when I received the item, I was so surprised that it was wayyyy too small and short. I don't know if aritzia changed the size scale or what. Actually I own another aronson sweater in a thinner version in S, that one looks as small literally. This one I would say the S looks like XXS to me. I really like this sweater. The fit is true to size, arm length appropriately long enough! Ordered a size M to be a little larger and fit over layers and it's just the perfect fit even with no long sleeve under its great. Very soft too! warm and fuzzy and fits well. I bought in two colors (purchased a second one after it went on sale). I tend to wear xxs - small depending on the item w Aritzia purchases, and the xxs fit me well/snugly. I am 5'6" and 125 lbs, ordered a size S. It looks way better than how the model wears it. I think the XS would fit perfect. So order a size down if you want a better fit. Love this sweater! It does get a bit itchy from time to time but for the most part it’s fine! Super cute for layering! It's perfect. It's really warm, slightly loose, and just long enough. As a shorter woman I was worried that it might be too long but it hits me mid-thigh. I haven't tried to wash it yet but I've worn it a few times and it keeps it's shape. Softest cardigan + so warm! I bought this last year in Htr Birch color and this year I bought the light grey version. Love the fit and looks so cute paired with a scarf and tank or tee underneath. Amazing quality too! One of my favorite sweaters. I have it in 2 colors and I’m sure I’ll buy more. This wool is soft, not itchy and keeps me warm in our frigid office, for early fall, or on sunny winter days. On my 5' frame, it ends about 2" above knee. For reference, I am 105lbs and the xxs fits with room for a blouse but the wrist is snug. The xs is looser but would have looked noticeably bigger if I had not ordered in black. Handwashes great with wool soap, put on spin cycle to gently remove excess water then hung on rack - no shrinkage. If only Aritzia carried length for petites. I bought this cardi because I needed one in blue. Turns out that it was a little too light in colour for what I was looking for. But it is the same soft, light-weight knit as the Plutarch and Thurlow, strangely the cuffs are doubled (folded into a seam) whereas the cuffs on the Plutarch and Thurlow are not. I found the cuffs too think/tight and wished they were the same as the others.